We are spoilt here by the variety of birds of prey we regularly see. It’s easy to be amazed at the bigger birds, the vultures, eagles and buzzards. 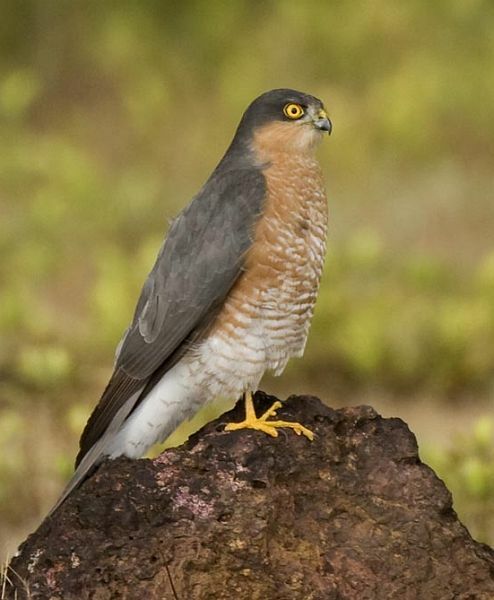 The Eurasian Sparrowhawk is resident here too, it is a forest-edged bird, preferring the cover of trees until winter when it is seen more often across open countryside. The male [below right] is distinctive with his barred orange breast, yellow eye and orange face. The female [below left], bigger than the male, is barred grey where her mate is orange. It is small, 11-16in long and 23-30 in wingspan, and can look similar in flight to a kestrel or goshawk [both also resident in Spain]. To hear the call of the Sparrowhawk and to read more about this beautiful bird, click here for the RSPB. This entry was posted in Nature and tagged Andalucia, birds, living abroad, Sandra Danby, Spain on October 27, 2015 by sandradan1. Looks like the male has caught a snake – best reason ever for inviting these regal hunters to take up residence nearby.